These are delicious buttery biscuits that are in a class by themselves. Not too sweet, but sweet enough to be considered a treat to serve with afternoon tea or coffee. 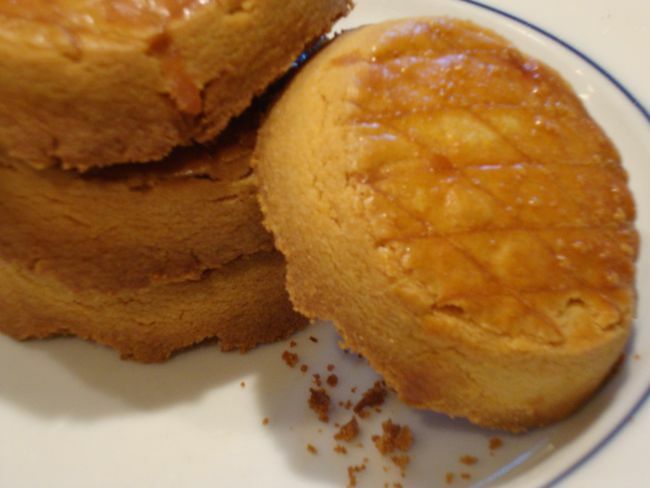 I didn’t grow up with this biscuit, but it did remind me of sweet crunchy cookies that my Granny made in Shanghai. The Hungarian word for biscuit, roughly translated, is pogácsa, and there are two basic types: salty or sweet. But within each category huge variations exist. The recipe here is Vajas pogácsa, and what makes this biscuit so delicious is the butter. You must use a top quality brand, or it’s not worth bothering with. I use Strauss, with a butterfat content of 85%, but Plugra is an excellent choice, too. The recipe comes from George Lang’s The Cuisine of Hungary (Bonanza Books, a division of Crown, 1971). His recipe says to use 1/2 cup confectioners’ sugar, but I find 1 cup works better. He also says to make the biscuits 1-inch thick, which is really too thick. I like them 3/4-inch thick. I decided to make them because I had a few extra egg yolks in the fridge that I needed to use. The recipe is easy and quick, and the biscuits absolutely delicious. They might remind you of shortbread. You must bake them until they’re dry and crisp throughout. If in doubt, bake them a bit longer. These biscuits keep for at least 2 weeks, covered airtight, at room temperature. Brush them with beaten egg and bake. That’s all there is to it. 1. In a large bowl or the work bowl of a food processor, combine the flour, salt, and confectioners’ sugar. Add the butter and work it into the flour with a pastry blender or food processor until the particles are the size of small peas. 2.Add the egg yolks and work it into the dry ingredients with a wooden spoon or by pulsing the food processor until the dough masses on the blades. Knead briefly by hand to make a smooth mass. Wrap in plastic and refrigerate 30 minutes to 1 hour. Or even overnight. 3. adjust an oven rack to the upper third position and preheat the oven to 350 degrees. 4. Roll the dough between two sheets of wax paper until 3/4-inch thick. Score a lattice pattern on the dough using the length of the blade of a sharp knife. Cut the dough into biscuits with a 2 1/2-inch round cutter. 5. Arrange the biscuits 1 inch apart on a large unbuttered cookie sheet and brush with the egg yolk glaze. Reshape scraps. Reroll and make more bioscuits. Bake about 30 minutes until cookies are a deep golden brown all over. Do not underbake. Cookies must be dry all the way through. Cool on wire racks and store airtight at room temperature where, iof your kitchen isn’t too hot, they will keep well for at least 2 weeks.